C.1915, Ansonia, Crystal Regulator No. 3 shelf clock in iridescent yellow, as-found. 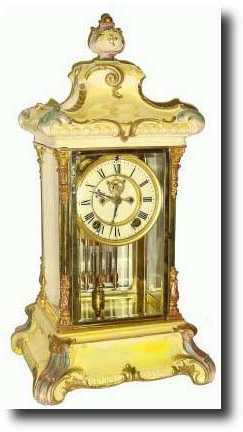 This is a very nice clock, but got bumped on top at some time and the top finial has a hairline around the stem. The balance of the clock is original and excellent, and we have moderated our estimate to allow for condition. Height 17"